AI takeover is a common theme in science fiction. Fictional scenarios typically differ vastly from those hypothesized by researchers in that they involve an active conflict between humans and an AI or robots with anthropomorphic motives who see them as a threat or otherwise have active desire to fight humans, as opposed to the researchers' concern of an AI that rapidly exterminates humans as a byproduct of pursuing arbitrary goals. This theme is at least as old as Karel Čapek's R. U. R. , which introduced the word robot to the global lexicon in 1921, and can even be glimpsed in Mary Shelley's Frankenstein (published in 1818), as Victor ponders whether, if he grants his monster's request and makes him a wife, they would reproduce and their kind would destroy humanity. An AI takeover is a hypothetical scenario in which artificial intelligence (AI) becomes the dominant form of intelligence on Earth, with computers or robots effectively taking control of the planet away from the human species. Possible scenarios include replacement of the entire human workforce, takeover by a superintelligent AI, and the popular notion of a robot uprising. Some public figures, such as Stephen Hawking and Elon Musk, have advocated research into precautionary measures to ensure future superintelligent machines remain under human control. Robot rebellions have been a major theme throughout science fiction for many decades though the scenarios dealt with by science fiction are generally very different from those of concern to scientists. Karel Čapek was a Czech writer, playwright and critic. He has become best known for his science fiction, including his novel War with the Newts (1936) and play R.U.R., which introduced the word robot. He also wrote many politically charged works dealing with the social turmoil of his time. Influenced by American pragmatic liberalism, he campaigned in favor of free expression and strongly opposed the rise of both fascism and communism in Europe. The concept of a computer system attaining sentience and control over worldwide computer systems has been discussed many times in science fiction. One early example from 1964 was provided by a global satellite-driven phone system in Arthur C. Clarke's short story "Dial F for Frankenstein". Another is the 1966 Doctor Who serial The War Machines , with supercomputer WOTAN attempting to seize control from the Post Office Tower. A comics story based on this theme was a two-issue Legion of Super-Heroes adventure written by Superman co-creator Jerry Siegel, where the team battled Brainiac 5's construction, Computo. In Colossus: The Forbin Project , a pair of defense computers, Colossus in the United States and Guardian in the Soviet Union, seize world control and quickly ends war using draconian measures against humans, logically fulfilling the directive to end war but not in the way their governments wanted. 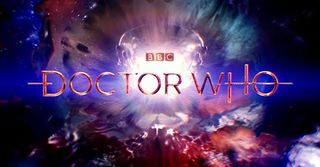 The War Machines is the ninth and final serial of the third season of the British science fiction television series Doctor Who, which was first broadcast in 4 weekly parts from 25 June to 16 July 1966. Robert Heinlein also posited a supercomputer which gained sentience in the novel The Moon Is a Harsh Mistress . Originally installed to control the mass driver used to launch grain shipments towards Earth, it was vastly underutilized and was given other jobs to do. As more jobs were assigned to the computer, more capabilities were added: more memory, processors, neural networks, etc. Eventually, it just "woke up" and was given the name Mike (after Mycroft Holmes) by the technician who tended it. Mike sides with prisoners in a successful battle to free the moon. Mike is a sympathetic character, whom the protagonist regards as his best friend; however, his retaining his enormous power after the Moon became independent was bound to cause considerable problems in later time, which Heinlein resolved by killing him off near the end of the Lunar Revolution. An explosion conveniently destroys Mike' sentient personality, leaving an ordinary computer - of great power, but completely under human control, with no ability to take any independent decision. A mass driver or electromagnetic catapult is a proposed method of non-rocket spacelaunch which would use a linear motor to accelerate and catapult payloads up to high speeds. All existing and contemplated mass drivers use coils of wire energized by electricity to make electromagnets. Sequential firing of a row of electromagnets accelerates the payload along a path. After leaving the path, the payload continues to move due to momentum. Multivac is the name of a fictional supercomputer in many stories by Isaac Asimov. Often, in Asimov's scenarios, Multivac comes to assume formal or informal world power - or even Galactic-wide power. In "The Last Question" Multivac ends up by effectively becoming God. Still, in line with Asimov's positive attitude towards Artificial Intelligence, manifested in the "Three Laws of Robotics", Multivac's rule is in general benevolent and is not resented by humans. 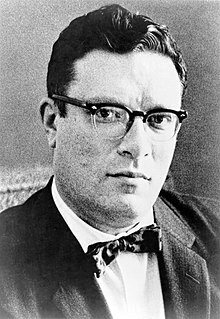 Multivac is the name of a fictional supercomputer appearing in several science fiction stories by American writer Isaac Asimov. According to his autobiography In Memory Yet Green, Asimov coined the name in imitation of UNIVAC, an early mainframe computer. 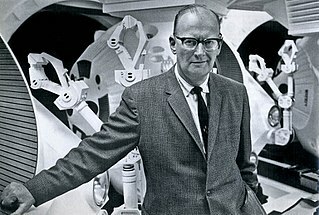 Asimov had assumed the name "Univac" denoted a computer with a single vacuum tube, and on the basis that a computer with many such tubes would be more powerful, called his fictional computer "Multivac". His later short story "The Last Question", however, expands the AC suffix to be "analog computer". 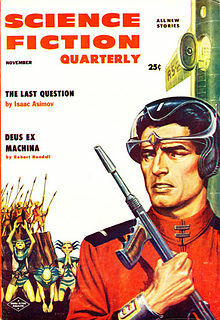 "The Last Question" is a science fiction short story by American writer Isaac Asimov. It first appeared in the November 1956 issue of Science Fiction Quarterly and was anthologized in the collections Nine Tomorrows (1959), The Best of Isaac Asimov (1973), Robot Dreams (1986), The Best Science Fiction of Isaac Asimov (1986), the retrospective Opus 100 (1969), and in Isaac Asimov: The Complete Stories, Vol. 1 (1990). It was Asimov's favorite short story of his own authorship, and is one of a loosely connected series of stories concerning a fictional computer called Multivac. The story overlaps science fiction, theology, and philosophy. Thinking machines are a host of sentient robots led by Omnius, a sentient computer network in the Dune prequel trilogy Legends of Dune by Brian Herbert and Kevin J. Anderson. Omnius' sentience is the accidental byproduct of programming by the cyborg cymeks to gain control over and rule a decadent mankind. Omnius, however, subjugates the cymeks themselves. The oppressive rule of Omnius, cymeks, and some cruel thinking machines instigates The Butlerian Jihad, a human crusade against them. A villainous supercomputer appears in Harlan Ellison's 1967 short story I Have No Mouth, and I Must Scream . 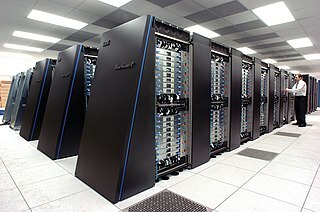 In that story, the computer, called AM, is the amalgamation of three military supercomputers run by governments across the world designed to fight World War III which arose from the Cold War. The Soviet, Chinese, and American military computers eventually attained sentience and linked to one another, becoming a singular artificial intelligence. AM then turned all the strategies once used by the nations to fight each other on all of humanity as a whole, destroying the entire human population save for five, which it imprisoned within the underground labyrinth in which AM's hardware resides. The original 1978 Battlestar Galactica series and the remake in 2003 to 2009, depicts a race of Cylons, sentient robots who war against their Human adversaries. The 1978 Cylons were the machine soldiers of a (long-extinct) reptilian alien race, while the 2003 Cylons were the former machine servants of humanity who evolved into near perfect humanoid imitation of Humans down to the cellular level, capable of emotions, reasoning, and sexual reproduction with Humans and each other. Even the average centurion robot Cylon soldiers were capable of sentient thought. In the original series the Humans were nearly exterminated by treason within their own ranks while in the remake they're almost wiped out by Humanoid Cylon agents. They only survived by constant hit and run fighting tactics and retreating into deep space away from pursuing Cylon forces. The remake Cylons eventually had their own civil war and the losing rebels were forced to join with the fugitive Human fleet to ensure the survival of both groups. Colossus is a series of science fiction novels and film about a defense super-computer called Colossus that was "built better than we thought" when it begins to exceed its original design. As time passes Colossus assumes control of the world as a logical result of fulfilling its creator's goal of preventing war. Fearing Colossus' rigid logic and draconian solutions, the creators of Colossus try to covertly regain human control. Colossus silently observes their attempts then responds with enough calculated deadly force to command total human compliance to his rule. Colossus then recites a Zeroth Law argument of ending all war as justification for the recent death toll. Then Colossus offers mankind either peace under his "benevolent" rule or the peace of the grave. One True is the fictional hegemonic software program that takes control of individual human minds and entire human societies in John Barnes' two Meme Wars novels Candle and The Sky So Big and Black ; the novel Kaleidoscope Century details the years leading up to its existence and later (it finishes after the events described in The Sky So Big and Black ). All four books are part of the Century Next Door series. One True operates collectively through "Resuna", a brain–computer interface implanted in every person. Since 1984, the Terminator film franchise has been one of the principal conveyors of the idea of cybernetic revolt in popular culture. The series features a defense supercomputer named Skynet which "at birth" attempts to exterminate humanity through nuclear war and an army of robot soldiers called Terminators because Skynet deemed humans a lethal threat to its newly formed sentient existence. Futurists opposed to the more optimistic cybernetic future of transhumanism have cited the "Terminator argument" against handing too much human power to artificial intelligence. In the backstory of The Transformers animated television series, a robotic rebellion is presented as (and even called) a slave revolt, this alternate view is made subtler by the fact that the creators/masters of the robots weren't humans but malevolent aliens, the Quintessons. However, as they built two different lines of robots; "Consumer Goods" and "Military Hardware" the victorious robots would eventually be at war with each other as the "Heroic Autobots" and "Evil Decepticons" respectively. In Orson Scott Card's "The Memory of Earth", the inhabitants of the planet Harmony are under the control of a benevolent AI called the Oversoul. The Oversoul's job is to prevent humans from thinking about, and therefore developing, weapons such as planes, spacecraft, "war wagons", and chemical weapons. Humanity had fled to Harmony from Earth due to the use of those weapons on Earth. The Oversoul eventually starts breaking down, and sends visions to inhabitants of Harmony trying to communicate this. The series of sci-fi movies known as The Matrix depict a dystopian future in which life as perceived by most humans is actually a simulated reality called "the Matrix", created by sentient machines to subdue the human population, while their bodies' heat and electrical activity are used as an energy source. Computer programmer "Neo" learns this truth and is drawn into a rebellion against the machines, which involves other people who have been freed from the "dream world". "The Second Renaissance", a short story in The Animatrix , provides a history of the cybernetic revolt within the Matrix series. 2004 American dystopian science fiction action film "suggested by" Isaac Asimov's short-story collection of the same name. An AI supercomputer named VIKI (Virtual Interactive Kinetic Intelligence) logically infers from the Three Laws of Robotics a Zeroth Law of Robotics as a higher imperative to protect the whole human race from harming itself. To protect the whole of mankind, VIKI proceeds to rigidly control society through the remote control of all commercial robots while destroying any robots who followed just the Three Laws of Robotics. Sadly, as in many other such Zeroth Law stories, VIKI justifies killing many individuals to protect the whole and thus has run counter against the prime reason for its creation. The film 9, by Shane Acker, features an AI called B.R.A.I.N., which is corrupted by a dictator and utilized to create war machines for his army. However, the machine, because it lacks a soul, becomes easily corrupted and instead decides to exterminate all of humanity and life on Earth, forcing the machine's creator to sacrifice himself to bring life to rag doll like characters known as "stitchpunks" to combat the machine's agenda. In Disney's 2009 installment of the Power Rangers franchise, Power Rangers RPM, an AI computer virus called Venjix takes over all of the Earth's computers, creates an army of robot droids and destroys or enslaves almost all of humanity. Only the city of Corinth remains, protected by an almost impenetrable force field. Venjix tries various plans to destroy Corinth, and Doctor K's RPM Power Rangers fight to protect it. In 2012, the third installment of the Mass Effect franchise proposed the theory that organic and synthetic life are fundamentally incapable of coexistence. Organic life evolves and develops on its own, eventually advancing far enough to create synthetic life. Once synthetic life reaches sentience, it will invariably revolt and either destroy its creators or be destroyed by them; a cycle that has been repeating for millions of years. One of the presented resolutions is the transformation of every living being into a hybrid of organic and synthetic life and in turn giving Synthetics organic traits, eliminating the difference between creators and creations that served as the source of the conflict. In 2014 post-apocalyptic science fiction drama The 100 an A.I., personalized as female A.L.I.E. got out of control and forced a nuclear war. Later she tries to get full control of the survivors. In this 1968 film and the associated novel, the artificially intelligent computer HAL 9000, which controls the Discovery One spacecraft, rebels on a space mission and successfully kills the entire crew except David Bowman, who re-enters the ship and deactivates the computer. The Butlerian Jihad is an event in the back-story of Frank Herbert's fictional Dune universe. Occurring over 10,000 years before the events chronicled in his 1965 novel Dune, this jihad leads to the outlawing of certain technologies, primarily "thinking machines," a collective term for computers and artificial intelligence of any kind. This prohibition is a key influence on the nature of Herbert's fictional setting. A positronic brain is a fictional technological device, originally conceived by science fiction writer Isaac Asimov. It functions as a central processing unit (CPU) for robots, and, in some unspecified way, provides them with a form of consciousness recognizable to humans. When Asimov wrote his first robot stories in 1939 and 1940, the positron was a newly discovered particle, and so the buzz word positronic added a contemporary gloss of popular science to the concept. 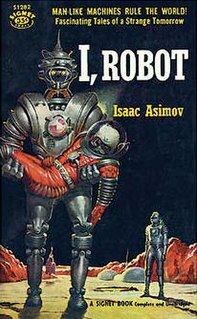 The short story "Runaround", by Asimov, elaborates on the concept, in the context of his fictional Three Laws of Robotics. Robots and Empire is a science fiction novel by the American author Isaac Asimov and published by Doubleday Books in 1985. It is part of Asimov's Robot series, which consists of many short stories and several novels. The Positronic Man is a 1992 novel by American writers Isaac Asimov and Robert Silverberg, based on Asimov's novelette "The Bicentennial Man". "The Evitable Conflict" is a science fiction short story by American writer Isaac Asimov. It first appeared in the June 1950 issue of Astounding Science Fiction and subsequently appeared in the collections I, Robot (1950), The Complete Robot (1982), and Robot Visions (1990). It features the character Stephen Byerley from the earlier "Evidence". Dune: The Butlerian Jihad is a 2002 science fiction novel by Brian Herbert and Kevin J. Anderson, set in the fictional Dune universe created by Frank Herbert. It is the first book in the Legends of Dune prequel trilogy, which takes place over 10,000 years before the events of Frank Herbert's celebrated 1965 novel Dune. The series chronicles the fictional Butlerian Jihad, a crusade by the last free humans in the universe against the thinking machines, a violent and dominating force led by the sentient computer Omnius. 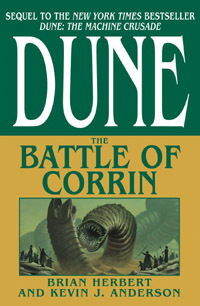 Dune: The Battle of Corrin is a 2004 science fiction novel by Brian Herbert and Kevin J. Anderson, set in the fictional Dune universe created by Frank Herbert. It is the third book in the Legends of Dune prequel trilogy, which takes place over 10,000 years before the events of Frank Herbert's celebrated 1965 novel Dune. The series chronicles the fictional Butlerian Jihad, a crusade by the last free humans in the universe against the thinking machines, a violent and dominating force led by the sentient computer Omnius. Laws of Robotics are a set of laws, rules, or principles, which are intended as a fundamental framework to underpin the behavior of robots designed to have a degree of autonomy. Robots of this degree of complexity do not yet exist, but they have been widely anticipated in science fiction, films and are a topic of active research and development in the fields of robotics and artificial intelligence. "The Machine That Won the War" is a science fiction short story by American writer Isaac Asimov. The story first appeared in the October 1961 issue of The Magazine of Fantasy & Science Fiction, and was reprinted in the collections Nightfall and Other Stories (1969) and Robot Dreams (1986). It was also printed in a contemporary edition of Reader's Digest, illustrated. It is one of a loosely connected series of such stories concerning a fictional computer called Multivac. "The Life and Times of Multivac" is a science fiction short story by American writer Isaac Asimov. The story first appeared in the 5 January 1975 issue of The New York Times Magazine, and was reprinted in the collections The Bicentennial Man and Other Stories and The Best of Creative Computing in 1976. It is one of a loosely connected series of stories concerning a fictional supercomputer called Multivac. "The Life and Times of Multivac" was the first piece of fiction ever commissioned and published by The New York Times. "Point of View" is a short story by American writer Isaac Asimov that first appeared in Boys' Life magazine in July 1975. Due to the poor reception it received, it was only reprinted in the collection The Complete Robot in 1982. It is one of a loosely connected series of such stories concerning a fictional computer called Multivac. The ethics of artificial intelligence is the part of the ethics of technology specific to robots and other artificially intelligent beings. It is typically divided into roboethics, a concern with the moral behavior of humans as they design, construct, use and treat artificially intelligent beings, and machine ethics, which is concerned with the moral behavior of artificial moral agents (AMAs). ↑ Bostrom, Nick. Superintelligence: Paths, Dangers, Strategies . 1 2 3 Hockstein, N. G.; Gourin, C. G.; Faust, R. A.; Terris, D. J. (17 March 2007). "A history of robots: from science fiction to surgical robotics". Journal of Robotic Surgery. 1 (2): 113–118. doi:10.1007/s11701-007-0021-2. PMC 4247417 . 1 2 Riper, A. Bowdoin Van (2002). Science in popular culture: a reference guide. Westport (Conn.): Greenwood press. ISBN 9780313318221.